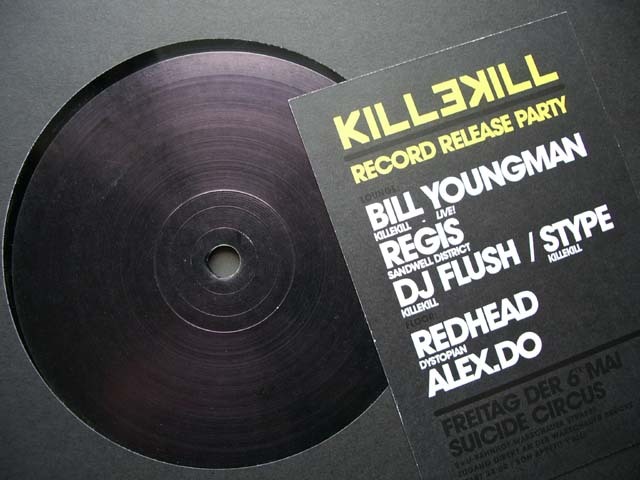 When browsing new arrivals at Hard Wax, a black sleeve sporting yellow writing KILLEKILL did not remain unnoticed. And created some irritation, leading in first place to a question: What’s in this criminal kind of name? WWW helped out that it’s an organization throwing parties in Berlin and also running a label that has reached number three of the catalogue. At first instance I thought Sandwell District has come with a new moniker, because of familiar loops and smudged atmosphere in “HH3”. But it’s Bill Youngman and nice to hear the American around, more than a decade after his debut on Serotonin. He comes with a decent release for floors, “HH3” following the canons of contemporary techno productions, constructed on inexhaustible loops. Though, my first impression was not far-fetched: Sandwell District is present, doing a solid but quite ordinary version of “HH3”. Concluding the B-side, “Trilogy” catches more attention with waving electro feel, for a good change after more energetic tracks. A record that will find a place in many DJ cases without breaking any barriers. On this occasion, the29novfilms, an outstanding director for techno videos, has provided motion picture versions of Killekill003, here the Sandwell District remix.